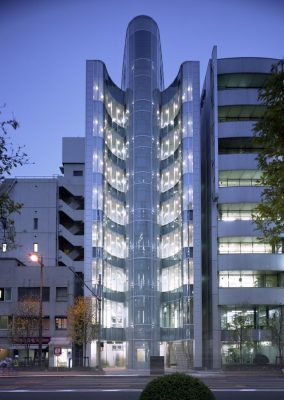 Nine storey commercial building – reminiscent of a spine, a vertebral column formed from concrete, each floor as a vertebra. 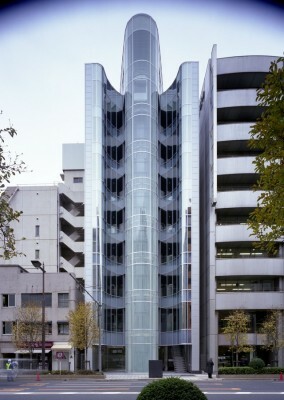 Jun Sakaguchi as a practice director of PTW Architects won a design competition for this small commercial block in Tokyo in 2006. Crowned with a penthouse rising above the 31m height limit but within the set-back line, it glows like finely cut jewellery. Most surrounding buildings are 31m high, so the penthouse enjoys open views from the timber deck terrace to the Tokyo Station area and further up to the Shinjuku district. 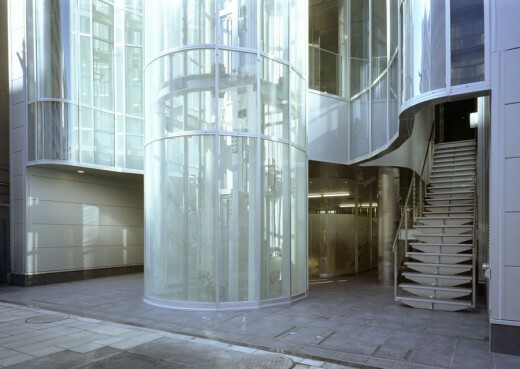 The façade has a beautiful and deeply curved glass wall, which maximizes the frontage for tenants and continually reflects changes in the environment. 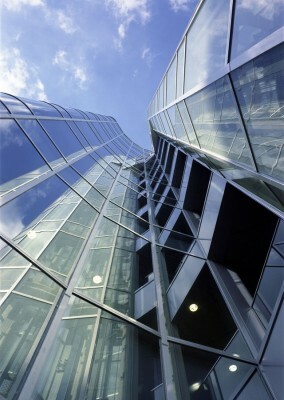 A central glass lift-well unifies the curve of the penthouse with the lower levels, creating a symbolic form. This building provides a new landmark and a novel way to activate a typical commercial area. The plan provides 95% efficiency of net area on typical levels with the innovative design approach providing an environmentally friendly design for its tenants.